It was a cold, blustery day and I knew I wanted to make a warm, hearty, comforting dish. I also knew I had a lot planned for the day and not too much time to spend in the kitchen. 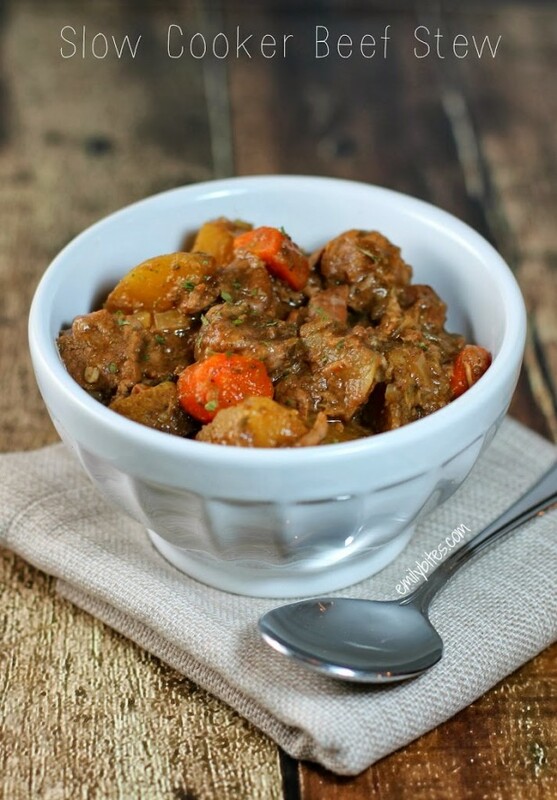 This Slow Cooker Beef Stew was the ideal meal to meet all my needs. There’s no pre-cooking, you basically just chop everything, toss it in the slow cooker and let it do all the work for you. I love meals like that! The beef and vegetables cook to tender perfection and one serving is super filling. You can even cook this overnight! How easy is that? Place the beef cubes in a large Ziploc bag. In a small dish, combine the flour, salt and pepper. Pour the flour mixture over the beef and seal the bag. Shake bag until beef is well coated. Pour the beef into your slow cooker . Pour all the remaining ingredients over the beef and stir to combine. Cook on low for 9-10 hours. Ooh, I’ve never even had a rutabaga before – I’ll have to try it! You are on a roll! Will make this weekend for sure! It is cold here in Arkansas too and this sounds awesome! Aw, thanks Miranda – hope you love it! You totally read my mind (almost)! 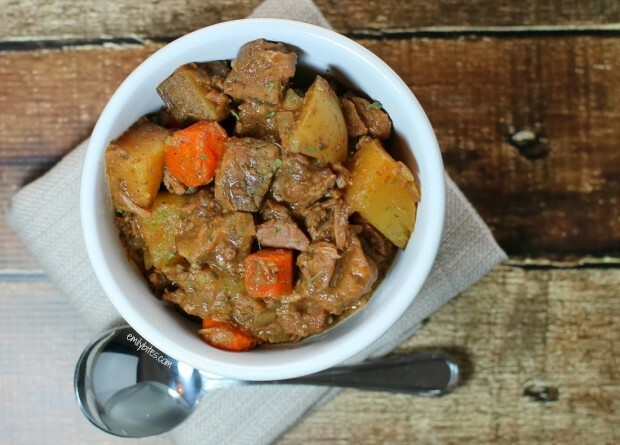 With St. Patrick’s day around the corner, I’m feeling like making some of my Irish favorites…well I haven’t found any skinny recipes for Guinness Beef Stew. Of course it will change the nutritional info, but I think all I need to add is a bottle of guinness and a couple TBS of tomato paste. Those seem to be the only consistent elements of Guinness Beef Stew that this one doesn’t already have. Thanks a million (again and again)! Great minds think alike! Let me know how the Guinness version turns out! My husband was just requesting stew the weekly menu. This looks like a winner! Should the beef weight 2 lbs before or after it’s trimmed? I’m making this today! I’m a little worried because the broth didn’t cover all the meat and veggies. I’m not an experienced crock pot cook, so I’m trusting the process:-) Thanks!!! I hope you loved it! The liquid didn’t cover the other ingredients in mine either – it will be perfect! Made this tonight for dinner. Delicious. My husband loved it too! I can’t believe how easy this was for how delicious it turned out. I added some oregano and garlic powder as we love garlic flavor! Thanks for this recipe. This will be on the menu for Thursday, I love that I can pop it into the slow cooker and it’ll be ready when I get home. Is there anyway to cut down the cook time? Like maybe 3 hours on high and 3-4 on low? I’ve never tried it that way, so I can’t really guarantee any results. If you try it, let me know! I don’t know if the reply fuction is working propperly…anyway, I posted about making this with Guinness. I made it over the weekend with 1 can of Guinness and 2 TBS of tomato paste. It was SOOO flavorfull. I can’t say if the flavor was much different from your original recipe but I will be making it again before St. Patrick’s Day. Everyone love it, including me, and I actually don’t usually care much for beef stew (weird I know). Made this tonight exactly as it. OMG!!!! So good. Had my brother, his wife and my nephew over for dinner and there wasn’t even enough left for my lunch tomorrow. Will definitely make it again. Made this last night, and it was awesome! I’ve only tried your wonton cupcake recipes before this (which are super addicting btw). Can’t wait to try more of your recipes! I have this simmering in my crock-pot right now and it smells HEAVENLY!!! I can’t wait to taste it. I love your style–good home style cooking that makes me feel as if I’m not dieting at all. Thanks for all the work you do to make my healthy eating that much easier. Your site is my go-to for delicious, healthy, weight watcher friendly recipes. Thanks! I made this last night! It was amazing!! Everyone was sniffing as it was cooking!! My teen daughter ate 2 bowls full…thank you for a keeper!! I see there is 8 points per serving. What is the measurement of a serving? Just found the serving size! Making this tonight, can’t wait! How much is a serving? 1 cup? 2 cups? When I made this the first time, about a year ago, the flour came off the beef and was floating in the stew, any idea what I did wrong? Hm, not sure, I’ve never seen that happen! Definitely try it again. Do you think I could sub sweet potatoes or butternut squash for the potatoes? My partner despises regular potatoes. Any other subs would be appreciated! Thanks. I think sweet potatoes would be great! This beef stew was the best I’ve ever cooked! The meat fell apart after simmering all day, and the veggies were perfectly cooked. All of the seasonings were balanced so well, and it was totally flavorful. Thanks for the great recipe! Hi, I’m not sure you’ll see this since the recipe is old but my mom can’t eat gluten and I was wondering what you’d recommend instead of the flour — cornstarch? 1:1 ratio? Thank you! I have never tried it with cornstarch, so I don’t feel comfortable recommending that – I’m not sure. I think I’d probably just try it omitting the flour first. I wanted to comment on the gluten free option – there are lots of gluten free flours available that can be subbed 1:1. Look in your baking aisle or the organic/health food section of your grocery store. My husband is celiac and we are a gluten free household. Be sure to check all your ingredients (broth, Worcestershire sauce, spices) as well. I just made your blueberry baked oatmeal with gf ingredients and they turned out delicious! I recently had a baby, am back to work full time and searching for WW friendly slow cooker recipes. The problem is that I don’t have a ton of time in the mornings. I am guessing the potatoes would brown if you chopped them the night before but can everything else be chopped ahead of time? And could the beef cubes sit in the bag with flour overnight? Thank you! I left them on but you can do either :). Enjoy! Just tried this and it was super yummy! The only thing I did differently was I turned it on high halfway through because the veggies weren’t cooking quick enough but it could be my crockpot. My family and I love this recipe! However, when I put this exact recipe into my recipe builder it comes out to 9 (freestyle) sp. I thought you should know so you could double check your calculations. Mine look right as well! Feel free to use your own if you feel more comfortable. HELP! I just opened the slow cooker / instant pot after 9 1/2 hours on low ( novice user and inexperienced cook!). The meat isn’t all cooked and what is isn’t tender. The potatoes which are small pieces aren’t cooked either! How can I save the dish? The meat was from Whole Foods! I’m sorry, I have no idea how that would happen! I don’t have any experience with using the instant pot to slow cook but after 9 1/2 hours the meat should DEFINITELY be cooked. Perhaps there is something wrong with your pot or the lid wasn’t shut correctly? I wish I could help!